Tagged christmas, gifts, holiday, wrapping paper. Bookmark the permalink. I would frame some of it to display during Christmas! 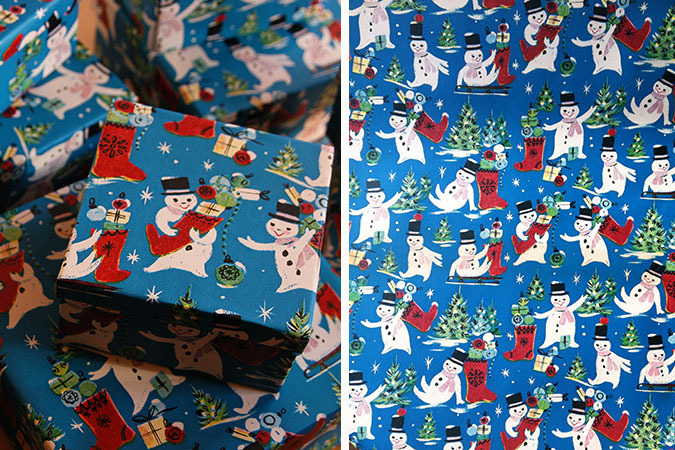 I love vintage wrapping paper! it really is perfect. i love that idea too! i have a roll of paper that I have been hoarding. also, i totally use my best paper only for people i know will “appreciate” it. haha! Oh my! No wonder you were practically tinkling yourself in the store! I can’t believe how well it’s endured the decades! The ink still looks so vibrant! Gah! Check out those happy snow fellas in all their many festive poses! It’s sickeningly fabulous, Heidi! It almost takes your breath away! Goodness me! Even as hyper focused on Halloween as I am right now it sure made my heart race to see these beautiful Christmassy photos appear when I checked your blog this mornie! It’s too wonderful that as the day comes to a close on October 31st and all the spooky excitement of Halloween begins to fade – good ole color-rich cozy Christmas comes to the rescue right as we’re needing something to fill the void! You did such a bang-up job on the boxes, Heidi. They practically look store bought they look so cool and seamless, while still retaining that special handmade vibe! Congrats on such an exhilarating find! xox! Jeepers – that is a great idea! 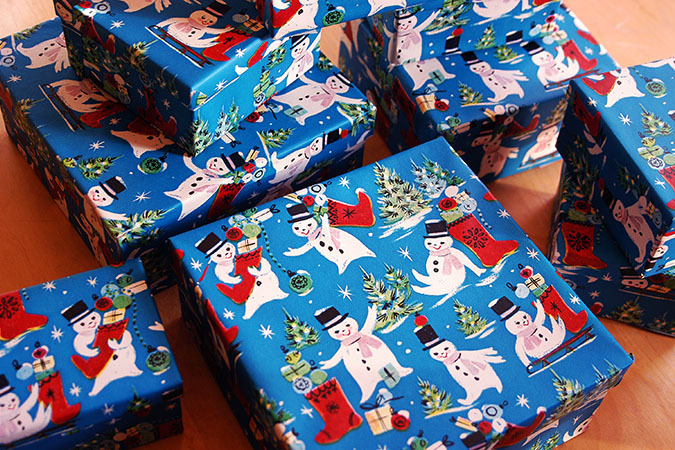 I have a big stack of vintage wrapping paper (folded) that I love and I can’t bear the thought of it using it only to have it be ripped up – using it to cover boxes is genius! It does make you feel better to give them to people that you know will cherish them. I’m the same way. Oh my gosh! That paper is absolutely darling! I like your idea! Cute! I think it would make a great fabric print. Congrats to you for dropping off 8 bags! I need to get motivated to do the same! You are so right once the saddness of Halloween ending creeps up—weve got beautiful exciting Christmas to start planning and decorating for! Jessica, thats a great idea too!